Yesterday my co-worker Bill noticed an extraordinarily long, but thin, shrimp leg darting in and out of a series of holes that appeared to be drilled through the top of the rock. He chiseled open the rock and found this pistol shrimp. 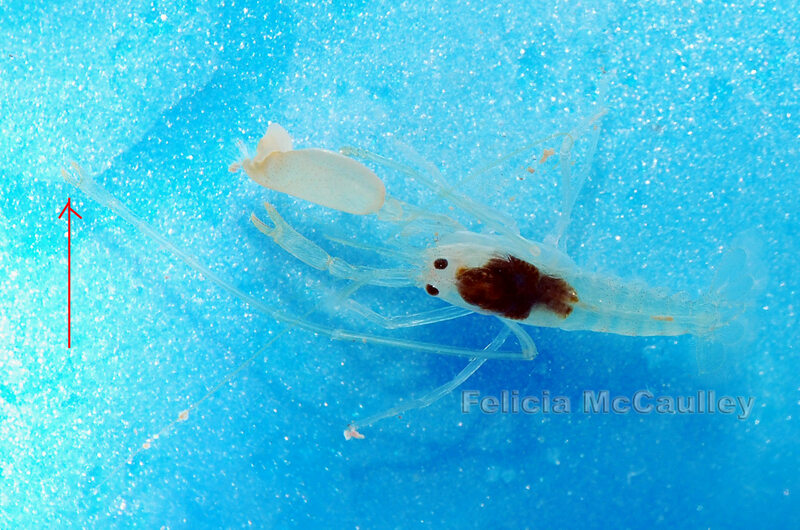 The pistol shrimp had to have been trapped inside the rock unable to leave since it was very young, similar to the way a gall crab grows inside a coral. If anyone recognizes this pistol shrimp and can identify it, please leave a comment. Looks like a Crinoid snapping shrimp. Look up the Genus Synalpheus. Looks like carnatus. Wow thats one hell of a claw! Did it lose its pigment being in the rock so long?